One of the things we enjoy at FS Construction Services is that, even when the work is the same, the job is always different. Every client, every worksite, every timeline has its own unique set of circumstances, peculiarities, challenges, and joys. Most projects feature their share of unique moments that make them stand out from the rest, whether it’s an unusual client request, incorporating various options or maybe even a unique location. While for many folks, the hour-by-hour, day-by-day grinding it out of doing the same kind of thing you did the day before can get monotonous, but not for us! 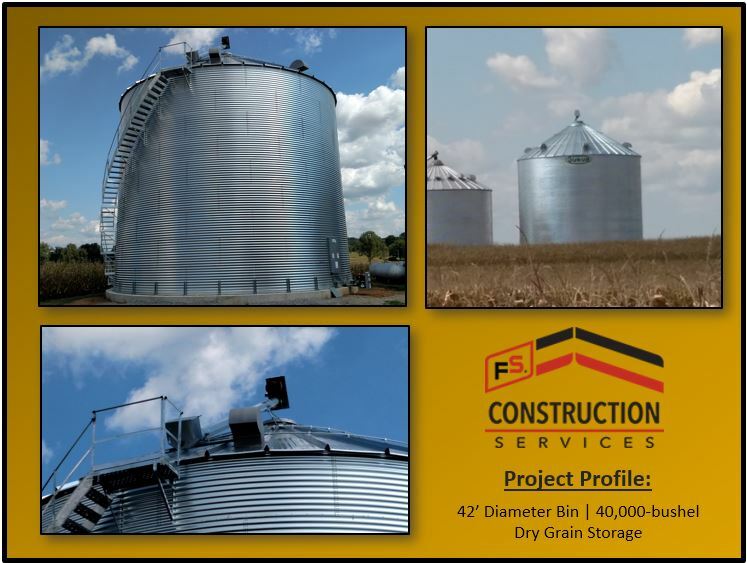 At FS Construction Services our team looks at each individual project as a chance to shine and deliver the highest quality grain storage systems to meet (or exceed) the customers’ expectations. Such was the case on a recent project. This project was unique and had to meet the client’s strict requirements. 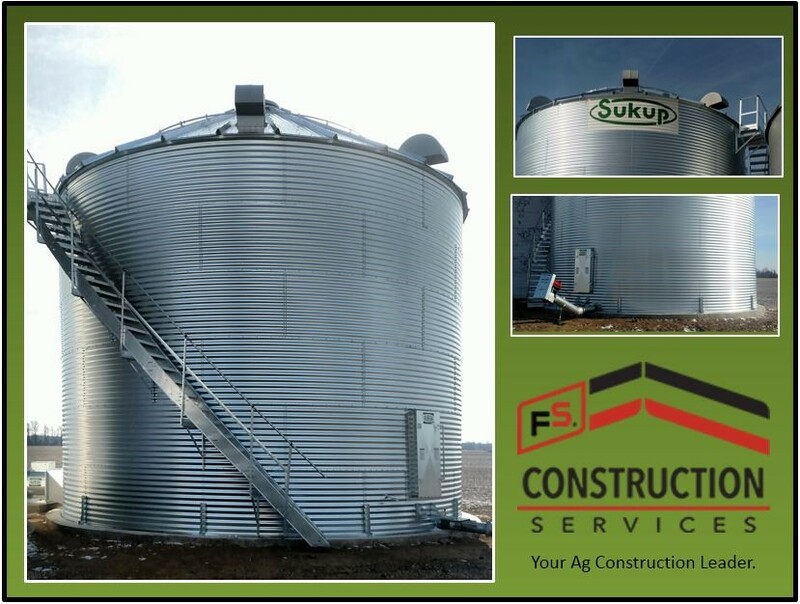 A 30’ tall, 6-ring Sukup grain bin with a bushel capacity of 14,700, a 24” axial fan for drying at a lower static pressure, a ladder with a safety cage, and an unload system. What made this project stand out, however, was the great customer: a local, family-owned farm in need of some increased capacity. Our team of experts always makes a point to get to know our clients and figure out exactly what they need so we can build them the most useful, cost efficient structure available. Sometimes that means a client needs the most cutting edge, largest, most impressive equipment on the market. And other times, it simply means the client needs something that works, day in and day out, just like they do, just like we do. If you are in need of any grain storage, grain drying, or grain handling equipment, please let Gateway FS Construction Services know. Give us a call at 866-551-3454, and let our specialists help you find exactly what you are looking for. We look forward to providing you the best customer service experience. At FS Construction Services, we have experience with all kinds of different projects. From large, demanding, commercial projects to those requiring more routine maintenance work, we’ve pretty much seen it all. There are times when our team needs to be on site for weeks, building, installing, and training. Regardless of the duration or the type of project we are assisting customers with, we are all about planning our work… and working that plan. This was the case recently on a brand-new grain bin project. We worked closely with our customer in the evaluation of their needs, recommendation of the right system to accomplish those needs and then planning and executing the installation. Working with proper lead time, our team was able to complete the project and have it up and running in time for harvest. 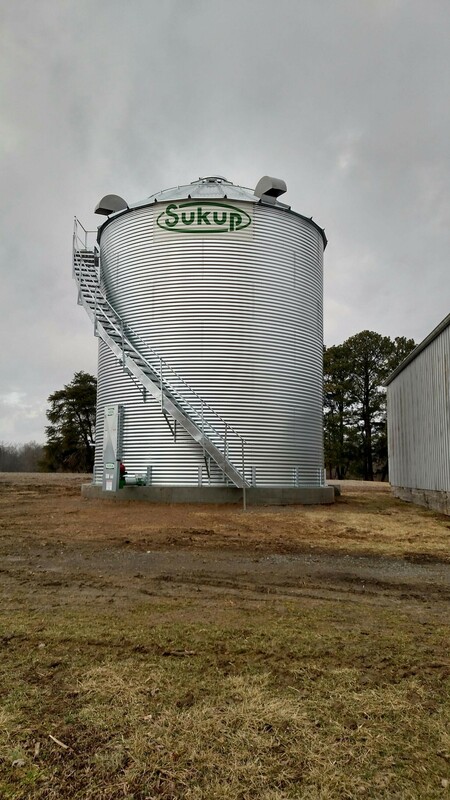 The 7-ring Sukup grain bin has a storage capacity of 24,800 bushels, an 8” power sweep, an axial fan, and stairs around the outside of the bin for safety and convenience. Additionally, we installed a Gravity Grain Spreader, which not only provides uniform grain distribution, but also requires less maintenance overall, and Hawk Cut flooring, which is twice as strong as smooth-bin floors. Our team, led by Nathan Koester, was quick to get to work on this large structure, making sure all the new equipment was installed and ready to go by the time our team rolled out. Our client was ready to go into harvest with everything they needed for a successful year. Thanks in large part to our long-lasting partnership with Sukup, our team is able to work quickly and efficiently with their equipment and buildings, allowing us to execute a well-planned construction project. If you are in need of grain storage, grain drying, or grain handling and transfer equipment, please let Gateway FS Construction Services know. Give us a call at 866-551-3454, and let our specialists help you find exactly what you are looking for. We look forward to providing you the best customer service experience. At FS Construction Services, we get the chance to work on all kinds of projects. We believe that no job is unimportant, no matter the size. But we’ve got to say, sometimes it’s just really fun to be able to go all in and provide a client with the whole works. This was the case earlier this year when we got to build an entire grain system, complete with drying, handling, and storage equipment. Nathan Koester and his team of Grain Systems professionals had the opportunity to make one farmer very happy when they built a 30’ diameter Sukup 6-ring grain bin, a 16’ long grain dryer, and 6” and 8” double runs. The grain bin, which has an eave height of 22’ and a capacity of 14,700 bushels, also features stairs wrapping around the bin and a catwalk for convenient and safe passage to the drying system. Speaking of which, the T16 continuous-flow dryer can dry an impressive number of bushels per hour, and comes equipped with the QuadraTouch Pro control system, which is easy to use and negates the need for constant monitoring. Finally, we installed an 8” double run which can fill the dryer at 4,000bph and a 6” double run which can unload the dryer at 2,000bph. While a project like this has a lot of big, moving pieces, proper planning and working closely with the customer made it a success. Our ability to provide the necessary concrete and electrical work expedited the process, and our client was able to begin drying wheat immediately after we finished construction. Whether you’re in need of an entirely new grain or seed system, schedule routine maintenance or you find yourself just needing some upgrades here and there, please feel free to let Gateway FS Construction Services know. You can give us a call at 866-551-3454, and let our specialists help you find exactly what you are looking for. We look forward to providing you the best customer service experience. Five days is not a very long time, but when our team needs to get a job done, five days is all they need. 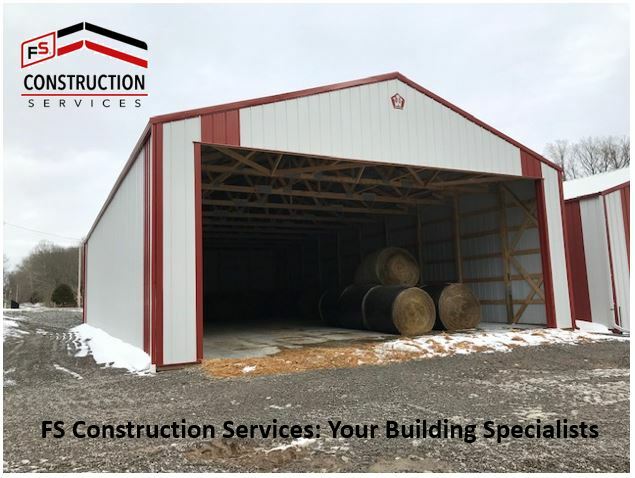 Early last February, with winter still a long way from ending, FS Construction Services worked hard to finish a client’s project in a tight time window without cutting any corners. From February 5th to February 9th, Nathan Koester and his team set to work on building a brand-new grain-storage bin. The grain bin was no slouch either, coming in at 24’ in diameter, 7 rings tall, and also featuring a horizontal power sweep, an axial fan, and wrap-around stairs. When it was all said and done, the total bushel capacity was 10,200 bushels. It’s during moments like this that our long-lasting partnership with Sukup proves so valuable. Our team has become so accustomed to working with their grain systems that it’s possible for us to build one from the ground up, complete with all the bells and whistles, in such a short amount of time. This allows us to work with all kinds of clients with all kinds of requirements and needs. We know that sometimes time isn’t on our clients’ side, and we’re happy to have such a great team and such great partners that we can rise to whatever challenge presents itself. Grain bins and other agricultural equipment and systems come in all shapes and sizes. If you have questions about the right building or equipment for you, please feel free to let Gateway FS Construction Services know. You can give us a call at 866-551-3454, and let our specialists help you find exactly what you are looking for. We look forward to providing you the best customer service experience. For most people, the beginning of January is a time to sleep off holiday meals and hibernate a little bit before the new year really gets going. That wasn’t the case, however, for our clients. These three generations of farmers wanted to get a head start on the year and make sure they had all the equipment needed for the growing season to come. And since we take our clients’ priorities seriously at FS Construction Services, that meant getting out there in January and building a new grain bin. 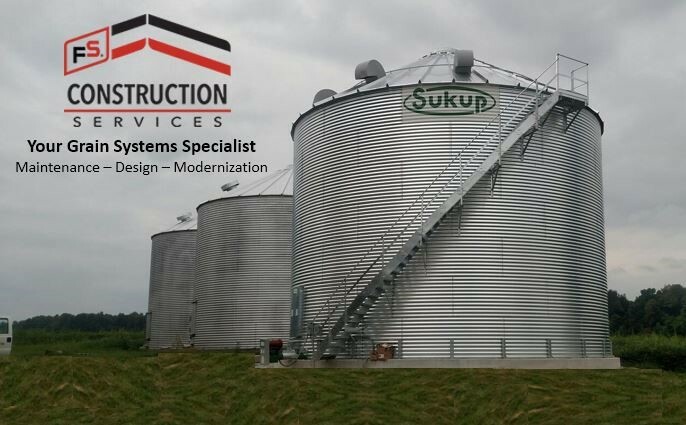 Over the course of ten days, Nathan Koester and his team constructed this impressive Sukup 30’ diameter grain storage project. At 6 rings tall and with a capacity of 14,116 bushels, this Sukup grain bin will set them up nicely for many years to come. The project also featured concrete finishing of a heavy-duty floor, designed to be extra smooth for ease of sweeping, an axial fan, an incline unload for convenient handling and transfer, and stairs that also attached to an existing drying bin. At FS Construction Services we always enjoy the opportunity to work with new customers and hear their stories. It was a joy for us to see three generations of family working together, each with their own experience and opinions of what they were looking for, but able to come together with a common purpose in mind and decide on the exact structure they needed going forward. 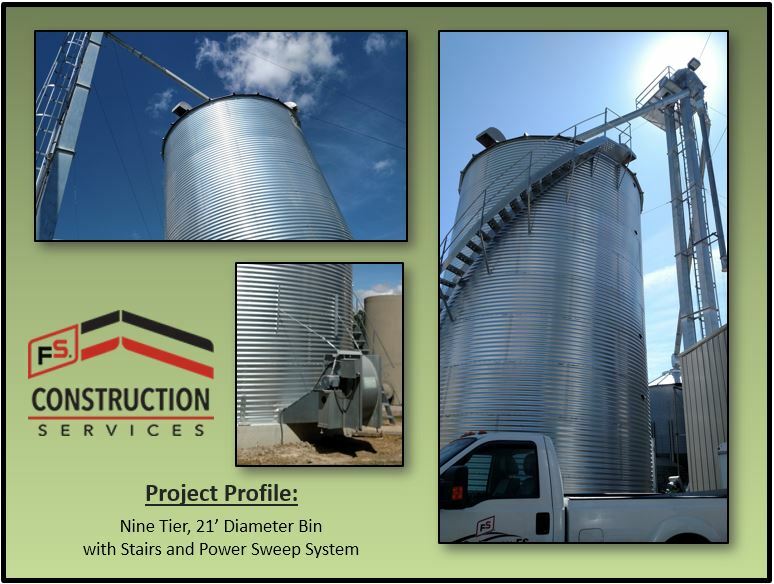 We were able to take our grain handling and storage construction experience and combine it with the clients’ very specific requirements. Once that process was complete we were able to work with our partner at Sukup to provide the ideal solution. With the design and planning complete, the construction crew took over and completed the project on time, on budget and to the high expectations customers have come to expect from our team. With over 40 years of experience, we know a thing or two about working as a team to finish a project. If you are interested in expanding your grain storage, or other grain system equipment, you can let Gateway FS Construction Services know. Give us a call at 866-551-3454, and let our specialists help you find exactly what you are looking for. We look forward to providing you the best customer service experience. At FS Construction Services we know that among the many things a bountiful harvest can bring is the need for more storage space. This was the case recently, with harvest right around the corner, when we were contracted to build a new storage bin. Luckily our team was up to the task, and in exactly one week’s time, our client was up and running with a brand-new grain storage solution. Nathan Koester, one of our Grain Systems expert, oversaw the construction of the Sukup grain bin. At 42’ in diameter and 9 rings tall, this new structure would provide instant help for the harvest to come with a capacity of 40,000 bushels. Additionally, the grain bin was outfitted with a roof auger, stairs, and an 8” power sweep. With our team in and out in a week, our client was able to continue preparing for the season to come with the assurance of having all the storage that would be needed. Thanks to our long-lasting partnership with Sukup and our familiarity with their products and equipment, we are able to work quickly and efficiently. This not only guarantees properly set up grain bins and systems, but it also means our clients can get back to their work sooner. 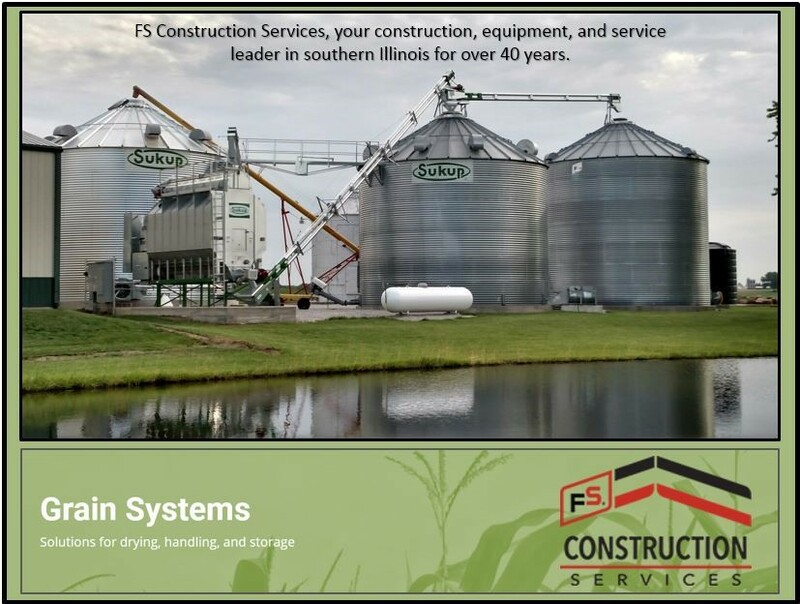 If you are looking to get a jump on the season to come or are in the market for grain drying, grain storage, or grain handling and transfer, let Gateway FS Construction Services know. We work with a number of trusted partners and employ the best in the business. You can give us a call at 866-551-3454, and let our specialists help you find exactly what you are looking for. We look forward to providing you the best customer service experience. If you spend any time at all driving across the Midwest you’re likely to become very familiar with two sights: fields and grain bins. From a distance, most grain bins look fundamentally the same. And yet, though their appearance may be commonplace, their function is anything but. 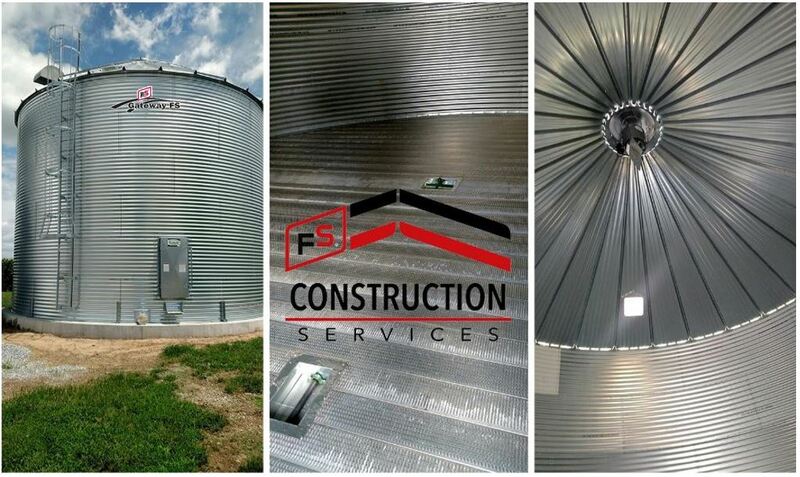 We build a lot of grain bins at FS Construction Services. But each one is its own unique structure, with its own unique purpose, and we believe it needs to be approached that way. Early last year at the tail-end of winter, our Grain Systems expert Nathan Koester oversaw the construction of a 21’ in diameter, 39’ tall Sukup grain bin. This 9-ring tall bin also featured stairs, a power sweep, and had a capacity of 9,800 bushels. This taller- and skinnier-than-most grain bin was designed to be used as a wet holding tank to feed a grain dryer. Though it may not be the flashiest construction we’ve ever done, and it may resemble many other grain bins we’ve built, it was the exact structure our client needed to ensure a successful growing season, simple in appearance, but functional and efficient. Our attitude towards every project that comes our way is how we can make it the best possible version of itself. At FS Construction Services we love a challenge. But we also love the simple, every day projects that allow our clients to do their work and do their work well. Whether you are looking for something extravagant, basic, custom, or somewhere in between, let Gateway FS Construction Services know. We work with a number of trusted partners and employ the best in the business. You can give us a call at 866-551-3454, and let our specialists help you find exactly what you are looking for. We look forward to providing you the best customer service experience.